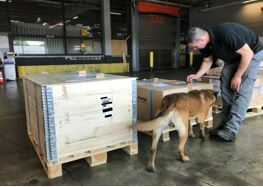 Dusseldorf Cargo has today (May 17th) got the official okay for using Explosive Detection Dogs for securing cargo shipments. The tool complements hand search, X-raying of freight or the screening of packages. Ali Babolsari, Dusseldorf Airport Cargo’s Manager Marketing and Sales is proud. “Finally we got the allowance to use Explosive Detection Dogs (EDD) for securing air freight consignments,” states the manager. He points out that unsecured air freight and mail loaded on board an aircraft must be made “secure” prior to being stuffed in the holds of a plane or the main decks of freighters, he reminds the industry. This is mandated by the EU Regulation 2015/1998. According to this provision, X-ray technology can be used, ETD (Explosive Trace Detection) or trained and licensed sniffer dogs (EDD). Most consignments are X-rayed after their arrival at DUS or any other airport. However, for shipments that cannot be secured by X-ray technology due to oversize or “dark alarm”, not revealing their contents, the EDD or ETD method is applicable. Both schemes are approved and certified by the German Civil Aviation Authority Luftfahrt-Bundesamt - LBA. DUS Cargo charges €0.11 per kilogram for their detection dog services with a minimum of €65.00 per shipment. Freight manager Ali points out that for the performance of the ETD or EDD security measure a special service form (FO-013-01) needs to be completed. At DUS Cargo, EDD security screening is available on Mondays, Wednesdays and Fridays (except on bank holidays) between midday and 3 pm.